Need ideas for more interactive teaching methods in virtual classroom to boost collaborative learning engagement and become more effective teacher? Learn how to apply the three-step interview, case-study and casework, simulations and role plays. Find specific examples for each method’s use on several subjects in the three forms of online implementation. The three-step interview (Kagan, 1992) is a method in the structure of learning cooperation/ teamwork through which partners interview each other on a specific study topic. It is worth noting that it employs techniques such as: role practice, role switching, as well as presenting an opinion different from our own and defending a thesis. The three-step interview can be incorporated into any type of lesson while its content can be practically of any kind. Which questions related with the topic would you like to explore? What do you already know about this topic? What else would you like to know as a result from today’s lesson? Which idea impressed you as the most meaningful today and why? Which were the main points from the last reading? Which part of your homework struck you as the most interesting? What is your attitude towards environmental issues? How did you solve the maths problem? What is your hypothesis or prediction at this point? The implementation of the three-step interview in VEDAMO Virtual Classroom is beneficial to collaborative learning. Synchronous communication allows the students to get immediate feedback both from the tutor and their peers which promotes the processes for collective knowledge development in the group. In VEDAMO Virtual Classroom the three-step interview can be easily implemented by dividing the main group of learners into separate pairs which can be observed by the tutor. In this way interaction between them is much more focused. In each group the interviewing student can take notes in their personal notepad which they can later use to form key points in their presentation and consequently share with the tutor. In the Virtual Classroom each pair of students works in an independent breakout room which is not disturbed and distracted by the other participants. Meanwhile, the tutor is able to observe the work of each pair. The implementation of such an organisation is unthinkable in a real classroom where it is often the case that students work in pairs but due to the noise and confusion which occur the teacher cannot keep track of the pair work and the students themselves get distracted by what the others do. The implementation of the three-step interview implies working in a limited timeframe. In VEDAMO Virtual Classroom both the tutor and the learners can easily keep track of the time using the in-built timer. Then, the tutor can effectively manage the interaction both in the small groups and the main group by means of the tutor’s Control Panel Tools. This is an effective way for saving time from the process of participant division and bringing them back together, so it promotes more effective and focused work. In the virtual learning process the method most often is applied in the teamwork form. However, its discourse component is not to be neglected, as its presence is exclusively strong without being primary. When it comes to the composition of the study hour, this strategy / method corresponds to the main structural part of the lesson where meaning comprehension takes place. The tutor is working with a group of four students. The tutor acquaints them with the main issues they are going to look at during the lesson. The tutor presents the information in a way of their choice. This session should not take more than 10 minutes. Next, students are allowed some time for planning the interview questions which they are going to ask in relation to the working topic already selected. The group of 4 students A, B, C, and D is divided into groups of two. The interviewer should take notes while taking the interviewee’s opinion on the topic set by the teacher at the beginning of the lesson. The interviewer carefully puts down the authentic opinions and fact interpretations of the studied material. They should also note the points that remain unclear or not understood by the interviewee. 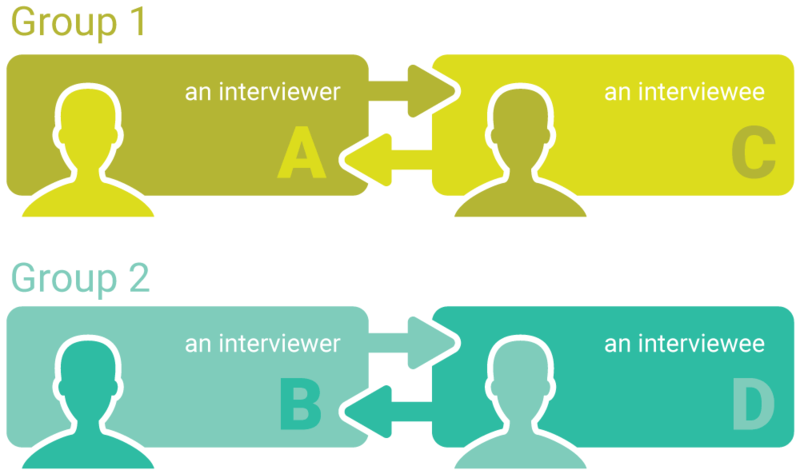 Roles switch after each completed interview. The tutor brings back together the whole group of 4 participants (A, B, C, and D). Each participant is supposed to share their partner’s opinion whom they have interviewed in front of the tutor and the other three students. All participants take turns to do this within a limit of 5 minutes for each. Finally, the tutor summarises all aspects of deviations in the participants’ perceptions (if there are such), highlights individual omissions, and makes clarifications. The tutor sums up in a dialogic form with the whole group. Both methods are used in collaborative learning more often with high-school students. Case-Study involves analysis of a real-life situation and finding a solution. The case-study working process takes place in small groups. Following the analysis of the situation alternatives are clarified and one of them is selected. A solution is worked out and presented in front of the other participants. Casework is also done in small groups. Students work on an imaginary case, close to a real-life situation, prepared in advance for discussion by the teacher. The task involves analysis of the situation and taking a decision again which turns the method into an excellent means for the main part of the virtual lesson unfolding. VEDAMO Virtual Classroom makes effective implementation possible for both methods. While working on cases or case-studies participants are divided into groups and the texts for discussion are shown on the whiteboard in each group. On separate pages of the whiteboard students can write down their solutions or suggestions together. The tutor sets up the timer in each breakout room and monitors and guides the work while each group works independently without being disturbed by the other participants. After the set time expires the whiteboard content in each group is copied and transferred onto the whiteboard in the main group. Each group chooses a speaker who presents the results in front of the others. During their presentation each speaker can be granted the role of presenter and shown in a separate video screen so that the attention of the group is directed at them. In VEDAMO Virtual Classroom casework can be varied if instead of a textual material students work on a case illustrated by a video material. Moreover, the two methods can be presented using a series of images. This serves as an additional motivator for participants’ imagination and creativity when formulating the problem and its solutions. In VEDAMO a similar approach can be easily implemented without making it necessary for the teacher to prepare in advance technical devices and didactic paper materials. The method touches upon the three forms of virtual learning in their full variety. Case-study and casework can be given as self-study homework, too. In the example given the main group comprises 9 members. They have been divided in advance into three groups of three whereas each group had been working on a different case. At the moment shown here, the separate groups have been brought together again into the main group with the aim of presenting the results from their work. The tutor is leading the presentations. The speaker of one of the groups is given the role of presenter and is presenting the solutions on the case. The presenting participant is shown in a separate video screen so that the others can direct their attention to him. Simulations provide the opportunity of experiencing a challenging situation in a safe environment. These may be physical or chemical processes, natural phenomena, world travels, and historical events among others. Simulations are defined as extended role plays; usually they have a specific script despite the fact that they are based on the participants’ experience. They trigger emotional engagement and are a powerful tool for learning through experience. By playing a role students accept as theirs something which may be quite distant to them otherwise. The power of this method is in the immersive experiencing and emotional thinking about “that which belongs to the other” and transferring it into “one’s own”, even if only during the role. Unlike simulations, it is the understanding of social roles that forms the basis of role plays. Usually with role plays there is a pre-set ideational framework and they are performed as a theatrical improvisation on a given topic. Students develop the situation in their own way playing different pre-negotiated roles in it. Another variant of role play is role reading a pre-set script. By bringing to life a given script new styles of behaviour are experimented and acquired which contributes to a change of attitude and enables learners to look for alternative approaches when dealing with a specific situation. VEDAMO Virtual Classroom offers a wide range of possibilities for doing simulations. When implementing them in VEDAMO the tools for collective work, the screen sharing tool and the media player can be employed in accordance with the aim and the topic of the simulation. The functionalities of the Virtual Classroom allow for a greater part of the senses to be involved during simulations which on its part brings learners closer to the imaginary situation and makes their experiences more meaningful and wholesome. This on its part contributes to a deeper rationalization of the processes studied, phenomena, interrelations, etc. In VEDAMO Virtual Classroom each participant has the freedom and the feeling for a personal space which allows them to experience and react fully in the simulation. This preconditions the successful implementation of the method whereas the traditional classroom implementation of the method does not provide this freedom. In the real classroom the psychological barriers of the participants and the technical features of the simulation (an individual screen and headphones are hard to obtain in a physical environment) hinder the effective achievement of the educational aims. The implementation of role plays in the virtual learning environment is different from that in the real one as body language possibilities are extremely restricted. On the other hand, in VEDAMO Virtual Classroom psychological barriers are easier and faster to overcome which contributes to the full involvement and active participation in the role play. When role-reading, put the script on the whiteboard, distribute the roles and give the floor to participants. After you finish reading you can end with a discussion or questions about the text. When carrying out role-play, put the ideational framework on the whiteboard and distribute the roles. If necessary, participants can be divided into groups and be given some time to discuss their ideas as to how the role play should proceed. If there are several role-plays and there are two or three participants in each group, you can play their individual video screens which create the impression of them being “on stage”. Once more, you can finish off with a discussion and feedback. With the help of the teacher’s controls and the division into groups in VEDAMO breakout rooms the teacher is able to ensure a high quality of role play by minimising distractions unavoidable in a traditional classroom. The advantages of conducting the final discussion in the virtual classroom also contribute to the successful method application. Due to the possibility that VEDAMO Virtual Classrooms offers for session recording and archiving, role plays and simulations can be subsequently reviewed and commented on by the tutor and the learners. A similar approach provides ground not only for improving learners’ skills but also for constructive feedback shared among themselves within the group. The implementation of a similar endeavour in a traditional classroom setting consumes a lot of time, involves effort and costs on the part of the teacher to provide a video recording of the event. Even if they manage to implement this, there is no guarantee that the recording has captured all key points and learners’ reactions. In VEDAMO the archive offers recordings from the point of view of each participant in the group. This is a precondition for a successful reproduction of the whole picture. Both in the simulations and the role plays all of the forms herein mentioned are active but the first form is especially successful – the interaction. This form of organisation and existence of the virtual learning environment enables both internal exchange and information processing within the separate individual-participant in the learning process (immersive experience, as mentioned above), and external exchange of information between the different roles within the lesson. Both methods can be effectively integrated into the main part of the virtual lesson. The tutor uses the whiteboard and the media player. The components of the compound can be visualised on the whiteboard. The students are assigned the task to choose the ratio in which to mix the components so as to get the expected result. If they choose the wrong ratio of components, the video result of the corresponding mixture is reproduced by the media player. When the right ratio is selected, then the media player reproduces the expected result. While students observe the reaction, the tutor has stopped their individual screen and is present in the learners’ mosaic. At this point, attention is not directed at the tutor but at the experiment. There are 10 learners altogether in the Virtual Classroom. Their task is to role play two open role plays around the idea of how would fairy tales develop, if they were taking place today. The tutor divides the participants into two groups. The first group has to play The Contemporary Red Riding Hood, and the second group – the Contemporary Hansel and Gretel. In both role plays there are 5 different roles determined in advance. Following the role distribution participants have 10 minutes to prepare and discuss the ideational framework of the role play in separate groups. Then again they gather in the main group where they role-play their versions. The tutor facilitates the process and assists the participants when necessary. The role play ends with a discussion about the way moral value attitudes change through the different generations, and about the way we keep and preserve our traditions.